Spring is in the air and Easter is just around the corner! And with their Limited Edition Spring Edition #Kellogger cereal, I got a bit in into Easter/Spring and made some Rice Krispie Squares with some Cadbury mini eggs for flowers. This Easter, though see Yummy Recipes - Special Occasions section on www.ricekrispies.ca, and the Rice Krispies Canada Pinterest Page at pinterest.com/RiceKrispiesCA/ for treat-making inspiration. 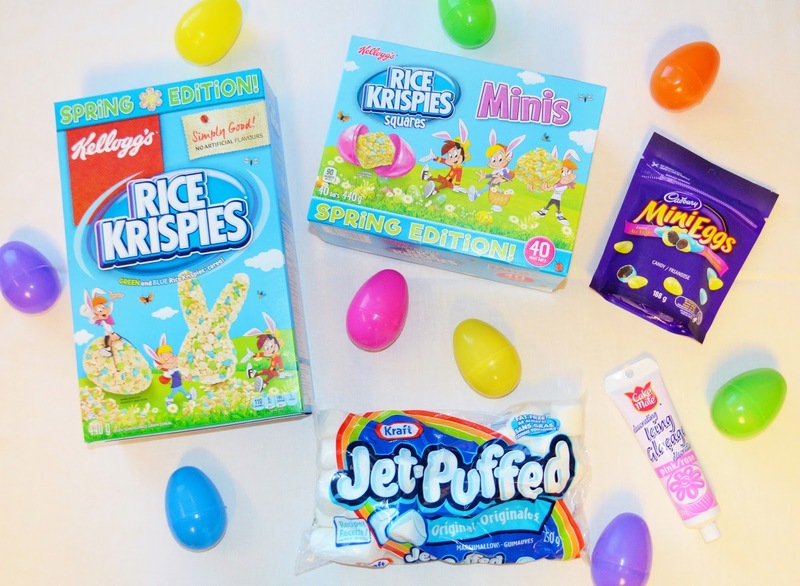 And, for scrumptious recipe ideas all year long, follow Rice Krispies on Twitter at RiceKrispiesCA , Facebook at Kellogg’s Rice Krispies Canada and Instagram at ricekrispies_ca! Here you'll find other great ideas for you and/ or the kids to make their own Easter creations. A random draw will be made by Random.org on April 21, 2017 from all Canadian entries received. Leave your contact info and let us know how often you buy Rice Krispie treats or make them in YOUR home. I buy them about once a month.I have always enjoyed rice cereals are my favourites . I buy the Rice Krispie treats weekly! Its the only snack my lil guy will take to school! Thanks! I buy Rice Krispies treats about once every two month. I get the huge box from Costco so it lasts quite a while. I like to make the treats with my kids around most holidays. We make Rice Krispie treats about twice a month...always a hit at our house. We make Rice Krispie treats every couple of months in my home. I don't usually buy the Rice Krispie Squares, unless needed for daughter's school or Halloween. I much prefer to make them, so I can make them ooey gooey with lots of marshmallows. I like to do so every few months. We make some eavey month all the kids and adults like them, wasy to make too! I love them but don't buy them very often. They are a special treat! Brenda brendaspuppy@hotmail.com I buy rice krispies about once every couple of weeks. The kids eat them for breakfast with bananas. I love making Rice Krispie treats. I make them a couple times a month. Everyone loves them and they don't last long in my house. I buy them about once a month for the boy's school lunch snack, and we make them normally around Christmas and other holidays. I buy Rice Krispies once every couple of months, but we usually use them to make treats instead of for breakfast. I buy it about once a month, and make treats maybe every couple of months. Love rice krispies, especially vanilla flavor. I have eaten rice krispies since a child and have never got sick of them. They are reasonally priced and make a really lite meal option. Usually buy a box every week. Great family cereal. I make them about once a month. I make rice krispie treats about once a year. I usually buy Rice Krispie squares and the cereal at least once a month. I make rice krispie treats every couple of months. My kids wish I would make them more often, though! I don't make them often. I made them once before, it'd be awesome to use the prize to make some! I normally have Rice Krispies cereal purchased every two weeks. Since this the cereal I enjoy the most. I love making Rice Krispie treats. I don't buy them as often as I used to, my kids are all grown, but I sure used to make tons of Rice Krispie Squares. I make Rice Krispie treats - I find the bought ones to be a bit dry. I buy Rice Krispies about once a month. I make my own Rice Krispies treats quite often because everyone in my home likes them. We buy when on sale otherwise we make them ourselves. WOWZERS when the kidlets were little I used to make them 2x a week cause they loved them so much and so did their parents (so so delicious) Now I make them once a month but if I know they are coming over then I have a pan ready. I make Rice Krispie treats 2 or 3 times a year, usually when little ones come to visit. We buy them occasionally, my daughter likes the vanilla flavour. And I do make Rice Krispy treats when they're in the house. We always have Rice Krispies and used to make a couple times a month but lately not as much! We make rice krispie treats about once or twice a month! OMG I love rice krispies. We buy Rice Krispie treats about every few weeks for the kids' snacks in their school lunches! I only make Rice Krispie squares if I am taking them to a family party or if I am at my daughters since I would eat them all if I made them for us. So, I make them every two or 3 months. We make rice krispiestreats about once a month or more. We love how versatile they are! We buy Rice Krispies squares every few months, but we have never tried making them ourselves. We usually make rice krispie treats for all holidays. We get them two or three times a year. I bought some this week for fun. we usually make them since they are so easy to make and it's a fun thing to do together. We make them maybe once every few months, I would say. we make them every few weeks. yummy! I usually make Rice Krispie treats on holidays, so once every few months or so. I loved it!There're many people in society who need shelter, care, medicine, treatment,schooling and all.The best fundraising campaign is for supporting them. I eat rice krispie squares everyday! I usually make rice krispies treats a few times a year for special occasions. We make them every month never get tired of them. this is a fun treat to make and eat, when the grandkids come over. I buy mine once a month and make squares as a treat for my kids. and i buy treats from the store every couple weeks, but a few boxes at a time. I buy them every month or so for the grandkids.